The price of precious metals rises and falls, but gold always retains some value. Because of its steady value and demand, gold is easy to buy and sell. Not only that, gold jewelry has a value beyond its status as a precious metal; gold jewelry also holds a market price from a design and fashion perspective. A piece from a well-known or in-demand designer could command value far beyond that of its precious metals. Gold has been used to hedge against inflation and the volatility of the stock market for decades and is staple part of most investment portfolios, not to mention it looks great on your wrist or ring finger. Whether you are looking to make some quick cash by selling your gold or are interested in long term investing, gold is a great idea. Keep reading to learn what you need to know to make a smart purchase, and to get the most for your gold. jewelry or bars keep in mind that pawnshops, jewelers and other brokers all determine the value of gold by its current open market value, which is always publicly available. This works to your advantage, as all parties involved will be working off the same baseline value. Gold is priced per ounce and is bought and sold 24 hours a day, 7 days a week all over the world; this means that the value is constantly changing by the second. The price of gold is affected by everything from the value of the U.S. Dollar to reserves in foreign banks. However, as a seller, it is not enough to know the current market value of gold. You should also know the weight your gold, as well as how pure your gold is. Armed with that information, you will know how much you can realistically expect for your gold, as your buyer will need to turn a profit on your items. When it comes time to field offers for your gold, you should compare offers from multiple pawn shops. By simply visiting a pawn shop nearby who deals in gold on a daily basis you can get a good idea of how much money you will receive if you sell or pawn it. Without a doubt, a pawn shop in your area is the best place to buy and sell gold, regardless if your gold is in the form of coins, jewelry or even gold bars. A pawn shop will be able to get you top dollar for even broken or out of date gold jewelry, as they may have it melted down and fashioned into something new, without passing on convenience charges or other such add-ons that you’d find at other places or at online buyers. Additionally, if you have your items have sentimental value for you, a pawn shop, is the best choice if it’s something that you may like to retain, as you can repurchase it within the terms outlined in your agreement when you sell. When determining the value of your gold there are several things to consider including Weight, Karat, Design and so forth. Getting the best price for your gold can be tricky so it helps to know what it is you truly have. See our Blog Getting The Best Price For Your Gold for additional details. It sounds over-simplified, but it’s true: the best time to sell your gold is when you need a little extra cash on hand. Until you have sold your gold, you haven’t realized it’s real value, and you are vulnerable to the whims of the market for the time that you are holding on to it. In other words, the best time to sell you gold is when you have a plan for the cash that you’ll receive for it. Be it to cover bills, to make other investments that may have a higher return, or simply to spend, the right time to sell is when it makes sense for your situation. Regardless of what form your gold is in, be it a bar, necklace or chain, you have something of great worth that you can sell or pawn at a pawnshop. Give a pawn shop near you a call to find out what kind of value you may have lying around the house. A significant bonus to buying your gold or gold jewelry at a pawn shop is that prices are typically much lower than retail for the exact same quality, usually 30% to 50% less. You are also dealing with brokers who are licensed and highly regulated, which means that buying your gold from a pawn shop is safe and reliable. You should always buy your gold from a reputable business like ours. Your research should begin before you even set foot in a single shop. Go to the website of each pawn shop near you that you are considering buying from and read reviews about them across many sites. 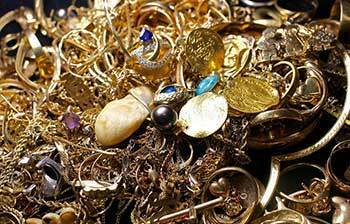 While doing your due diligence, pay particular attention to reviews about shops that specialize in gold and jewelry. When you’ve narrowed down your list to a few shops, visit them in person before you are ready to begin working with them. Keep in mind that gold items will vary from shop to shop; each piece is unique in its own way, so if you happen upon something that catches your eye or meets your needs, be sure to make an offer and be prepared to negotiate. A reputable shop like ours will be willing to negotiate with knowledgeable and courteous customers. Consider paying in cash and/or having items to trade to get a great deal. Don’t be afraid to ask plenty of questions about a piece. We will be happy to work with you to settle on a price that satisfies everyone. Buying and selling gold is a straightforward way to make quick cash and pick up an item that will steadily increase in value. Although the recent gold rush of 2011 may be behind us, pawn shops in your area are ready and able to offer you top dollar and give you the best deal, regardless if you are buying or selling gold. Inland Empire, like in the Ontario, Upland, Chino, and Pomona areas, have been in the gold business for decades. We have a vested interest in keeping you happy and are hands down the fastest, safest and most advantageous way to turn your precious metal into cash in your pocket, or in helping you make a smart investment.